of mail sealed by Postmaster Thomas Wood, Destination New York. Dropped near Crawfordsville due to adverse wind. Reached destination by train. 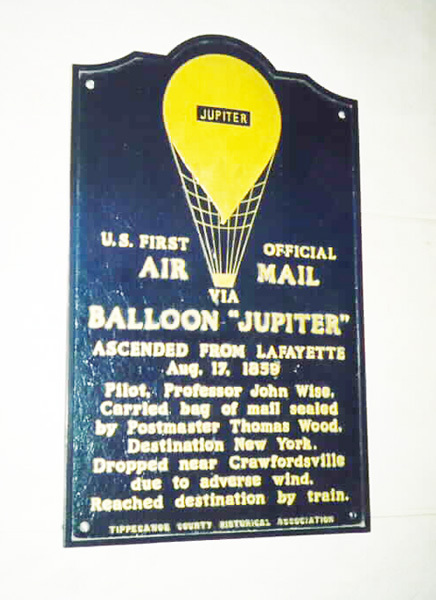 On Tuesday, August 16, 1859, Professor Wise attempted his balloon flight from Lafayette, but after floating only a short distance he was forced to land. He made a second attempt the next day, August 17, 1859. Below are a couple of newspaper articles from that time telling about this event. The second ascension of Prof. Wise, as announced yesterday, took place from the vacant lot near the Gas Works, at precisely two o'clock this afternoon, in the presence of a large number of citizens. 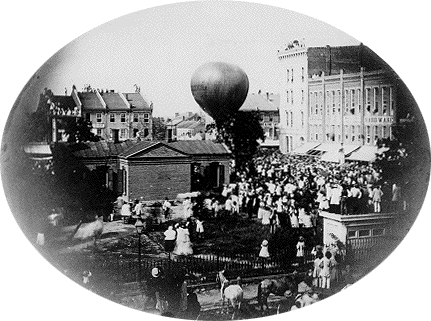 The beautiful air-vessel moved off gracefully to the southeast, but after reaching an elevation of about two thousand feet, the local current changed to the west, and, after remaining in full view for fifty minutes, suspended as it were almost over the city-the Balloon was lost in the dim distance on the south west. Before disappearing altogether, it descended almost to the level of the horizon, and it was the general impression that Mr. Wise had determined to make a landing, but in a few minutes the Balloon again ascended to it former altitude. The Aeronaut had evidently been "feeling" for a favorable current. The ascension from this city was grand and beautiful in the extreme, but in view of the fact that the local currents are adverse, we have little to hope from the experiment as a trans-Continental voyage. It does not seem possible that Mr. Wise will be able to make any considerable progress toward the seaboard, and we shall not be surprised to hear of his descent this evening somewhere in Southern Illinois or Western Kentucky. The fact is, that the aerial ship "Jupiter" is about as well adapted to the navigation of the "upper current" as Mr. Wise is adapted to preach the gospel. The great expansion of gas in the rarified atmosphere of that region, renders navigation with a small balloon for any length of time, utterly out of the question. This is the opinion of Mr. Wise and other distinguished aeronauts, who have experimented in the current. Mr. Wise is thus compelled to depend upon the local currents, and unless these shall change to serve his purpose, the trans-Continental voyage will be a transcendent failure. We have made arrangements with Mr. Wise for a special dispatch from the telegraph station nearest the place of his descent, giving full particulars of the voyage, and all "incidents or accidents" connected with the same. We shall lay it before our readers at the earliest possible moment. The grand aerial trip to the seaboard has terminated in a trans-county-nental voyage. A hurried note from Mr. Wise, written at a late hour last night, informs us that he made a landing about four and a half miles below Crawfordsville, at eight minutes after 7 o'clock. He had been up exactly five hours and seven minutes. 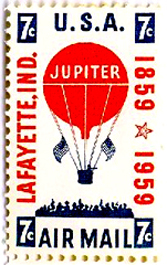 Everything was favorable at starting, but after reaching an altitude of two and a quarter miles, the Balloon entered an adverse current and drifted to the south-west. In the hope of again reaching the favorable current from which he had just emerged, Mr. Wise opened the valve and rapidly descended towards the earth. He came down almost in the tops of the trees, and went scudding before the wind, at the rate of 12 miles an hour. He was unsuccessful, however, in changing his course toward the seaboard, and, discharging nearly all his ballast, he again ascended with the determination, if possible, to reach the great upper current. He reached it in just 36 minutes by the watch, but the ascending power of his balloon had been so materially exhausted, that he found it impossible to get into the current. The balloon struck the swift current and rebounded like an air-ball on a ceiling. After three different attempts to "get on the track" (to use the language of Mr. Wise,) he again opened the valve and came down with the intention of landing in the public square at Crawfordsville, but the local current carried him below the town. He threw out his rope to an Irishman, but the son of Erin had never before seen a balloon, and, half frightened out of his wits, refused to touch it. Mr. Wise insisted, but Paddy, crossing himself with superstitious awe, dodged behind a tree just in time to avoid a loaf of bread which the aeronaut had thrown at him. A half mile further on, Mr. Wise observed some women in the road near a farm house, and after a great deal of persuasion, induced them to take hold of the rope and pull the balloon to the ground. By the time the remainder of the gas had been exhausted, a carriage with a party of gentlemen arrived from Crawfordsville, and taking the aeronaut and the collapsed air-ship on board returned to the town, where Mr. Wise was consigned to "mine host." Taylor, of the Taylor House. This is the substance of our note from Mr. Wise, and no doubt contains a correct narrative of the voyage. In a postscript he speaks of the view as among the most beautiful he ever beheld. The Grand Prairie, stretching away to the west ward seemed like a mammoth pleasure garden, dotted here and there with pleasant summer houses and with the woodland enclosing it like a hedge-fence, Lafayette, Crawfordsville, Attica, and eight villages in full view, the river, the canal, and railroads altogether, presented a panoramic picture of singular and impressive beauty. "I was not so chagrined," says Wise, "as to be insensible to the fascinating loveliness of the picture." So endeth the "trans-continental" voyage. That is was only trans-county-nental is no fault of the great Aeronaut. His balloon was not suitable for a long voyage, nor was it possible to make one, except under a combination of the most favorable circumstances, and of the 234 ascensions embraced within his aeronautic career, we doubt if he was ever so completely the sport of the winds as on yesterday. 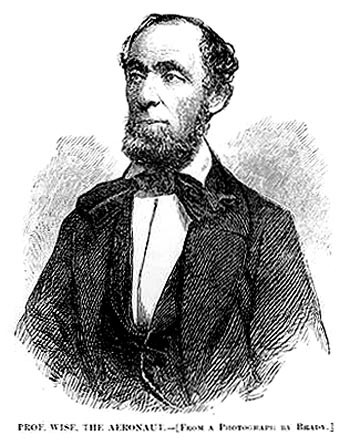 Dyer Picture from the event from WikiCommons and is in the public domain.